Sloppy joes don’t have to be made from canned sauce. Homemade sloppy joes are simple to make with ingredients you may already have in your kitchen. While this mixture is good on a bun, you can change things up and serve it over baked potatoes or rice. Start to brown the ground beef in a skillet over medium heat. Add in 1/2 cup of diced onions as the beef begins to sizzle and salt and pepper to taste. Add in 1 teaspoon flour, 3/4 cup of water, 2 teaspoons of Worcestershire sauce and 3/4 cup of ketchup and the beef begins to brown. 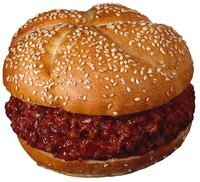 Reduce the heat and allow the sloppy joe meat to simmer, stirring occasionally. It should be ready to serve in 10 to 15 minutes. Serve the sloppy joes with pickles and cheese for additional flavor.